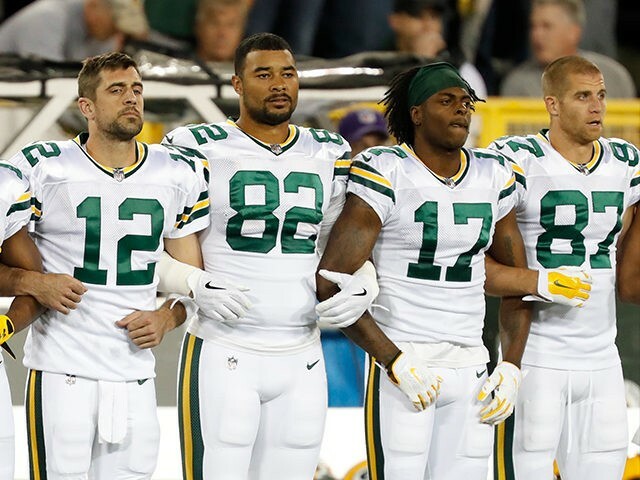 Nolte: Trump Wins Bigly as Every NFL Player Stands for Thursday Night Anthem – Forza Nuova U.S.A. Same thing happened Monday. They locked arms. They pouted. But the Dallas Cowboys all stood for the national anthem. As far as Sunday goes, the Pittsburgh Steelers have already reassured their justifiably enraged fans that when the national anthem plays, the team will stand. If these overgrown toddlers all need to lock arms and hold on to one another like scared little Care Bears, no one cares. If locking arms is how they choose to show unity or fight for equality or raise awareness or whatever the dumb, little SJW cause is this week, no one cares. The backlash against these crybabies, which is still growing, has only ever been about one thing — disrespecting the American flag. We know this because it is simply a fact that when you do not stand for the national anthem, you are, by definition, disrespecting the flag. NFL players suddenly choosing to respect the flag as opposed to spitting on it, is a victory for President Trump, who spoke for tens of millions of Americans last week when he lashed out against these selfish whiners. It is perfectly appropriate for the American president to defend the American flag against breathtakingly ungrateful millionaires. Until Trump spoke up, all these bubbled infants heard was praise from bubbled infants in the sports and political media, acclaim for how brave they are, plaudits for their wokedness… And all this from the very same sports and political media that mercilessly ridiculed Tim Tebow for taking his own kind of knee. Once again, Trump did what he does like no other: reminded us normal people that we are not alone in our beliefs and in our outrage. Once again, he punctured through the media’s false reality, a false reality that justified the indefensible, and once again we normal people stood up for ourselves and for our country. And maybe, just maybe, we have finally put a stop to this particular outrage. Regardless, the damage the NFL has done to itself will last for years. And who will ever forget or forgive the fact that the only form of self-expression the NFL allows its player, is to hate on America.